Sticks Gallery are very excited to announce Dominic Bradnum as the artist selected for the current solo exhibition at our Garbos Gallery space. Dominic Bradnum is a sound and visual artist from Worthing and has been exhibited throughout the UK and Europe. His amazing neon paintings span the traditional and the modern, utilising the medium favoured by the Masters, Dominic contrasts this painterly medium with the thoroughly modern medium of NEON, first utilised in the early part of the twentieth century and creates quite beautiful paintings that's simplicity in design is countered by the technique, skill and hours that go into every one. 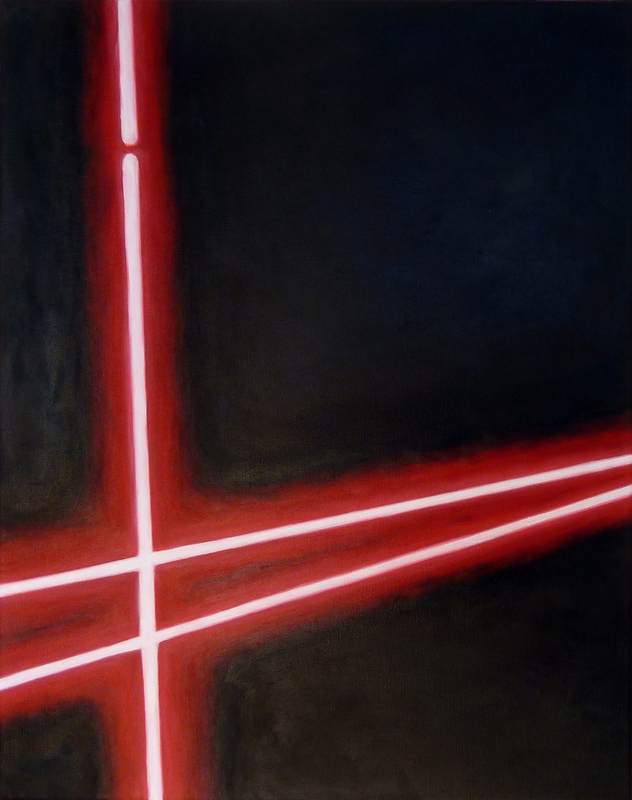 "My painting practice is primarily concerned with capturing the flickering, incandescent qualities of neon lights. I work mainly in oil paint, building up layers and glazes and taking advantage of the slow drying times to blend the pigment and create subtle changes of tone and contrast. Through this technique, the images take on an optical, almost transient, quality, playing with the viewers’ perceptions, as they seem to shimmer across the surface of the canvas." "The subject matter often takes a textual form – brash pop-art slogans, secretive thoughts, and enigmatic declarations evoking the post-modern human condition; these are increasingly set within bleak expressionist land- and sea-scapes or empty scenes of urban decay. Other works reference more abstract or minimalist forms: phosphorescent drips, meandering lines, geometric shapes and op-art patterns." His textual work is reminiscent of the type of slogans favoured by the wave of 80s artists that included Barbara Kruger and Jenny Holzer and more recently, Tracy Emin's I Promise to Love You series. However Dominic Bradnum's originality lies in how he approaches these iconic styles and clashes them. Neon has always been popular with artists since its inception and there has been a resurgence of late due in part to the work of Emin, Turk and Creed. But it is his use of oil paint and, in particular his line work that evokes a sense of the slightly seedy and desolate underbelly of neon and the venues their signs adorn. He does this whilst simultaneously retaining the painting as something quite beautiful. You can catch Dominic's NEON PAINTINGS at Garbos Gallery Southsea until 4th July 2016. To purchase his work either visit the gallery or visit our online gallery. Limited Edition prints of some of his pieces are also available at our Sticks Gallery space in Fareham.